How To Wear A Boot Knife Like Pro! There was a time when boot knives or camping knives were only worn by cowboys. Thankfully, those times are long gone. Today virtually anyone can carry this handy tool wherever they go. But are boot knives as useful as they were back in the cowboy days? For hunters, boot knives offer extra protection and are easy to reach. That being said, there are many reasons why wearing a boot knife will be beneficial. To enjoy the benefits that a boot knife offers you must first learn how to wear a boot knife. But before I get into the how of wearing a boot knife it is important I first explore some of the factors that will influence how you wear one. The type of knife and boot will determine how the knife is to be worn. Back when cowboys roamed the Wild West, wearing of boot knives was all the rage. The open design of cowboy boots allows for easy carriage of boot knives. Therefore, if you are wearing cowboy boots, you can simply slip it into your boot. When doing this, it is important to have the blade sheathed. On average a boot knife should measure 2.5 to 5 inches. Anything longer than 5 inches should be worn on the outside of the boot. In regards to the type of boot, the best boot to slip a knife into is one with a high ankle. If you have a long knife that you want to carry as a boot knife, wearing it outside is ideal. There are several ways you can wear a boot knife on the outside of a boot. And in this article, I will be discussing how to wear a boot knife sheath outside a boot. Another important factor to consider before wearing a boot knife is the sheath. Ideally, go for blades that have sheaths made of leather. The toughness of leather means it will not get punctured easily by the boot knife. The last thing you want is your boot knife falling of the sheath and injuring you as you walk. To avoid this, make sure that your knife is sheathed before wearing it. Carrying a boot knife is beneficial to hunter and law enforcement agents alike. For hunters, a boot knife is useful when you need to skin your prey. This is in particular for coyote hunters. Since skinning has to be done immediately after a kill, a boot knife will come in handy. Also, if you are hunting rabbits or squirrel by your crossbow using carbon arrows or by any other means, you can use the knife to butcher your kill. For campers, a boot knife offers security. This is in cases when you are attacked by an animal. In such an incident you can easily access the knife and deal with the threat. This applies to hunters as well. For fishermen, a boot knife will come in handy when you need to clean your catch. In particular, if you have caught a trout. Boot knives can also be used by bushcrafters. These knives can be used for carving and shaving wood. Therefore, boot knives have many uses, and this is why they have become such popular tools. Now that you have your ideal boot knife and a pair of boots, it is time to learn how to wear the knife. As alluded above you can wear a boot knife either inside the boot or outside the boot. Short and slim knives should be worn inside. On the other hand, a longer knife should be worn outside the boot. However, as stated above how you wear a boot knife will depend heavily on the kind of boot you are wearing. Let us start with how to wear a boot knife with cowboy boots. By know, you have already learned that wearing a boot knife with cowboy boots is very easy. The first thing you will need is a slim knife inside a sheath. Then slip it inside one of your cowboy boots after putting them on. The knife should fit snugly inside the boot. In my experience, bird and trout style knives can be worn inside a cowboy boot with ease and so can hickory paring knives. Thus, if you intend to carry these knives along with your best tactical tomahawks in your cowboy boots, it is very much possible. If you do not have cowboy boots, you can still enjoy the feeling of security that comes with wearing a boot knife. But before wearing a boot knife make sure you boot is designed to accommodate a knife. Some modern boots come with a sheath for placing the boot knife. If your boot lacks a sheath, you can make one. The sheath can be sewn on the inside of the boot using leather materials. Alternatively, you can sew the sheath or attach it to the outside of the boot. An alternative to sewing a sheath is wearing the knife in the same fashion cowboys wears them. As with cowboy boots make sure the knife is sheathed. Next slip the knife into one of your boots, with the handle sticking out. If you are right-handed, it is recommended that you wear the knife on the right boot. Also, make sure half an inch of the sheath is sticking out of the boot top. Finally, tie the handle to your calf to ensure it does not fall off while you walk. Ideally, the boot should have a high ankle. It is not wise to wear a boot knife in this manner if you have small ankle boots. Nonetheless, it is still possible to wear a boot knife if you have small ankle boots. However, it should not be worn inside. Instead, tie the sheathed knife of either your calf on the side of your boot. For longer knives tying them to your calf is more ideal. However, if the knife is small tie it to the side of your boot. 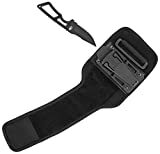 As stated above there are some boots that do come with a sheath where you can place the knife. It is important to note that if a boot is not designed to carry a knife, it may get damaged over time. Rubber boots, on the other hand, are usually tall and thus you can wear the knife inside them. However, it is important that you ensure the knife is protruding from the top of the boot. Alternatively, if you prefer wearing a boot knife outside, you can. The best rubber hunting boots usually have a high ankle, making them ideal for wearing a boot knife inside. As with all other boot types, the boot knife should be sheathed when being slipped inside a rubber boot. Overall, the way you decide to wear your boot knife will depend heavily on the type of boot you wear and the type of knife. Also, it will also depend on your preferences. Some people prefer wearing their boot knives in a concealed manner, i.e., inside their boots. In my opinion, it is better to wear the knife inside a boot. Before I end this article on how to wear a boot knife, it is important that I go over some few things about boot knives. Firstly, boot knives are not legal in all states and in some states are subject to certain regulations. Therefore, before wearing a boot knife familiarize yourself with your state’s law on the matter. Some states do not allow the carrying of double-sided blades. In other states, you are required to carry the blade concealed. For self-defense purposes, the best boot knife needs to be double-sided. This means it can cut both ways. While some states do not allow carriage of this type of blade if your state does allow, it is the best type of blade to carry. A double-sided blade will give you convenience and will be easy to use in case of an emergency. Another important thing to note that prices of boot knives vary. While there are some high-quality blades out there, some come with a hefty price tag. Fortunately, there are some great and affordable boot knives available as well. All the same, it is important to remember that blades made from high-quality steel will be pricey. The sheath of the blade should also be of good quality.